The popular exhibition revealed an interesting history of the missions, drastically different from the preserved churches, protected landmarks and museums these buildings serve as today. In 1834, the Mexican government secularized the mission system, and by the late 19th century the missions had drastically deteriorated. 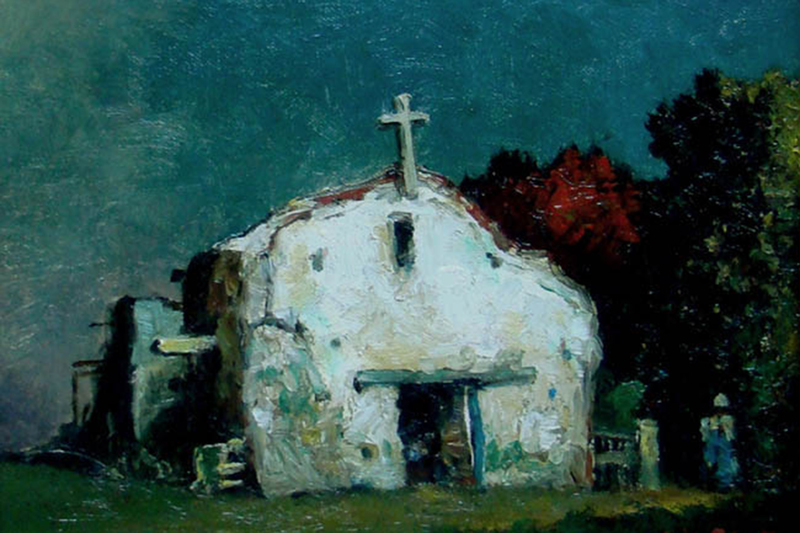 Sparks was one of many early California artists drawn to paint the missions in large part because of the dilapidated state of these structures, as their rustic and time-worn features exemplified Old California charm and nostalgia. The images created by these early artists and their contemporaries influenced the first movements to preserve and restore the missions. A painter, etcher and muralist, Will Sparks became one of California’s premier artists, known for his mission and nocturnal adobe scenes (Will Sparks 1862-1937). The exhibit featured the complete Alma de Bretteville Spreckels collection of Sparks’ final mission suite with paintings of California, the Southwest and Mexico. Born in St. Louis, Mo., Sparks showed artistic talent as a child, selling his first painting when he was 12. He attended the St. Louis School of Fine Arts, and then went to New York and Paris to the Academies Julian and Colarossi, where he studied with Jean-Leon Gerome, Henri-Joseph Harpignies and William-Adolphe Bouguereau.